Pipes appear to have been invented independently several places at nearly the same time and are known to have been in use as much as 5,000 years ago in China, Egypt, and the area presently known as Iraq. At a much later date, the Romans advanced the art of designing piping and waterworks, though the Roman empire’s fall reversed all that and waterworks were largely ignored in early middle-age Europe. Towns reverted to using wells, springs, and rivers for water, and wastewater was simply disposed of into the streets. Improvements were clearly needed, and fittingly, one of the first books printed after the invention of the printing press in the fifteenth century was Frontinus‘ Roman treatise on waterworks. The advent of the industrial revolution accelerated the need for pipes while providing economic and technical means to manufacture them. Pipes and channels have historically brought major advantages to those who had them, and successful pipeline or aqueduct projects have always required the right combination of political, economic and technical resources. History shows that most societies did not possess that combination, leaving them without advanced waterworks. Even today, a considerable part of the world’s population suffers from unclean drinking water and inadequate sewage systems. The technology to solve such problems exists, but too often, poverty or economic unrest holds back the development. In our modern world, pipelines have more applications than in previous times. They require relatively high initial investment and typically have a designed life-span of 40 years or more. That would probably not have impressed the ancient Romans, but it is still good enough to be more economical than alternative transport forms. Liquids can sometimes be cheaper to transport by ship, at least over long distances, but gas is difficult and expensive to transport in large quantities by any other means than pipelines. Gas can be liquefied, and Liquefied Natural Gas can be shipped long distances. To do so, however, a significant part of the gas’ energy has to be spent on the liquefaction itself, and gas pipelines are generally the preferred option unless very long distances, difficult terrain, prohibitive legal regimes, or other special problems prevent them from being used. Oil and gas pipelines can be very long, sometimes crossing country borders. Pipeline projects are often so important they get entangled in geopolitical complications, making long and careful negotiations with many interest groups an essential part of the project. Route selection is frequently dictated by environmental or political rather than technical concerns. High level politics was on daily display when this book’s author stayed some years in Azerbaijan in the 1990s, during a time when a pipeline route from Azerbaijan via Georgia and Turkey to the Mediterranean Sea was selected in competition with other, mostly cheaper alternatives. More than once, the amount of dignitaries visiting Baku in order to affect that and related decisions was so high that traffic flow in the city center suffered. For those managing the project at the time it must have felt like politics was everything and technology virtually nothing. In some recent projects we have even seen that choosing relatively expensive subsea rather than overland routes have been motivated by desires to keep the number of parties involved at a minimum. Again, politics is more than a little involved. At the time of this writing, an equally common and related problem faces the ASEAN countries (10 South-East Asian countries, including Indonesia, Malaysia and Thailand) in their efforts to expand their pipeline networks. Differences in national gas quality specifications make it hard to trade across borders: CO2-content can vary from nearly 30% to far less. This also complicates matters when securing backup alternatives in case of interruptions. One type of gas cannot always replace another even temporarily, and the added safety of having a gas pipeline network rather than one pipeline is reduced. Australia is an example of a country which has put intense effort into improving their gas quality standardization, and trade between different states goes more smoothly than it used to. Similar challenges related to gas quality standardization, customs for the gas as well as for spare parts, and a host of others are common all over the world wherever pipelines cross borders. In addition to the geopolitical, environmental, and economical questions facing pipeline projects, there are myriads of interesting technical challenges to be solved as well. This book focuses on some of those technical challenges, specifically the ones to do with making the fluid flow the way it was intended. That is obviously affected by everything inside the pipe (inner diameter, surface roughness, and surface structure), fluid properties (there are lots of them, including viscosity, density, specific energy, and compressibility), and the pipe wall itself (thermo-properties, insulation, and elasticity). The environment affects the transported fluid’s temperature, so submerged, buried and uncovered pipelines may have to be modeled slightly differently. The way the fluid flows is of course important to the pipelines’ capacity, but also sets important conditions for phenomena that can damage the pipe: Corrosion, erosion, and the potential formation of wax or other deposits fall into this category. Such damages fall outside the scope of this book, but the foundation for predicting them – the flow itself – is treated in detail. It is easiest to deal with flow of the single-phase type, meaning the fluid is either a homogeneous liquid or a gas, and that is what the book focuses on. But before going into details about pipe flow, let us have a brief look at some of the other aspects of relevance to pipeline projects. A pipeline is always designed in accordance with codes and specifications. Those specifications describe nearly everything to do with the design, such as which materials to use, working stresses, seismic loads, thermal expansion, other imposed internal or external loads, as well as fabrication and installation. In addition, the design depends on factors relevant to the specific pipeline, including the fluid(s) to be transported (oil/gas/solids, single/multi-phase), length and required capacity, the environment (warm/cold climate, overland/buried/subsea, urban/countryside), and operational conditions (need for valves, compressors, pumps, surge chambers, storage capacity). Code compliance is mandated by various governmental organizations. Codes can be legal documents, and like other laws, they vary from place to place. Contractual agreements may typically also have a say on which codes to use, and all in all selecting the right codes and standards is often one of the most important parts of the project. The different relevant specifications typically overlap, and it is essential to decide what to do when that is the case, for instance that the most restrictive code applies. Many of the legal conflicts arising in large projects have to do with how different codes should be interpreted, or even more common, when to apply which code. Frankel (1996, 2002) gives an overview over different codes relevant to pipeline engineers, and more details can be found there. As a general rule, though, it is best to stick to international codes and standards as much as possible, and to minimize the use of company- or project-specifications. The different phases in a pipeline project may vary considerably, depending on how large the project is, where it is, whether borders are crossed, whether the pipe goes over land or subsea, who manages it and a multitude of other factors. The phases shown below can therefore only be seen as a typical example. The main parameters are determined in this phase. They may include approximate pipe length with origin and destination, diameter, type of pipe, mass flow, capital cost, operating expenses with pressure loss and power consumption, main valves and pumping or compressor stations. Pipe flow simulations are very useful in this study. Both economical and technical feasibility should be considered. The project must be economical, and it obviously has to be technically possible. In addition, ‘political feasibility’ is a major factor since conflicts and geopolitics can pose daunting challenges. For overland pipelines, the route should be marked on various sorts of maps. This can most often be done by using existing maps in addition to taking aerial photography and surveys of the pipeline route. Route maps and property plats are created from these. Right-of-way acquisitions are normally not done in this phase, but they are taken into consideration. In case of rock tunnels, various additional sorts of surveys may be required, such as drilling to determine rock quality. Existing maps are often of little help for subsea pipelines. Surveying can be quite complicated and expensive, but seafloor mapping technology has developed significantly in recent years. Maps and terrain models are generated using depth data from multi-beam echo sounders mounted on the hull of survey ships, and Remotely Operated Vehicles (ROVs) are also used. Autonomous Underwater Vehicles (AUVs) have been used in some recent projects and can be more economical and faster for some surveying tasks. Many countries have strict laws prohibiting any activities from disturbing unexcavated archeological sites, and most project managers would surely prefer not to encounter any. But archeological sites can be stumbled upon almost anywhere. In a relatively recent development, The Ormen Lange-field off the Norwegian coast, a shipwreck was discovered, and archeological investigations had to be carried out before pipe lying. Needless to say, planning for such possibilities is not easy. How this is done is to a large extent determined by local laws, and they differ a lot. The process can take the form of voluntary negotiation with land owners, or it can be condemnation, meaning the land is acquired through an involuntary legal process. Usually, owners are entitled to compensation at a fair market value. This can be a complicated, lengthy process with many involved parties. In this respect, subsea pipelines are the easiest ones to handle. As already explained, crossing borders generally complicates this task, sometimes to unmanageable levels. This is similar to what was discussed under route selection, but the work is done in greater detail. Soil borings and various soil testing may in some cases only be possible after the acquisition of right-of way is finished, so it may have to be delayed until this phase. Because different industries use pipelines for different purposes, the design requirements are different and the types of pipe materials vary. In the petroleum and natural gas industry, steel pipe with welded joints is most common. Using high pressures steel pipes makes it possible to have fewer booster stations along the line, and steel’s ductility enables it to bend and withstand considerable impact without fracturing. In the water and sewer industries, on the other hand, pipes are normally under relatively low, sometimes atmospheric pressure. The low pressure has led these industries to prefer low-stress, non-corroding pipe materials as PVC and concrete. Both for low-pressure and subsea pipes, it is common for external loads to exceed the internal ones. Once necessary legal permits and design are approved, construction can start. For overland pipelines, that may involve clearing a path of minimum 15 m, bringing in the pipe, possibly ditching, trenching, boring, tunneling, and river crossing, followed by welding, coating, wrapping, pipe laying, and backfill with restoration of land. For subsea pipelines, it means laying the pipe from the laying vessel, in some cases including building ‘underwater roads’ or trenches, and to re-fill them after laying. The various valves and instruments along the pipeline must be tested and found functional. There may be additional tests, too, such as pressure and leak tests, and various cleaning procedures may be necessary. For subsea pipelines, the fluid used to achieve the required buoyancy during lying must be removed. The procedures may include running cleaning and instrument pigs through the pipeline. The whole purpose of constructing a pipeline is of course to have something flow through it, and understanding how the flow behaves is essential. Pipe flow simulation is used to optimize and verify design and to throw light on various operational issues. It is used not only through all the phases described in the previous chapters, but also for training engineers and operators. During pipeline operation, simulations are used for real time system estimation and forecasting, as well as for operator training. 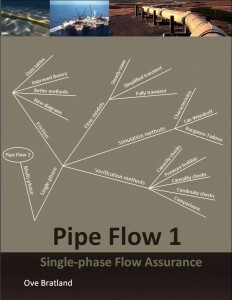 This book is about pipe flow, and it will show how the flow theory can help us to deal with all these tasks. There are many pipe flow simulation tools commercially available (Bratland, 2008), but using them correctly and efficiently requires understanding of what the programs do, how they work, and their limitations. State of the art simulation tools are not good enough to be reliable if they are treated as ‘black boxes’, and there is no substitute for understanding how they work in great detail. There is a danger that learning how to simulate can be misunderstood as learning how to interface with simulation program A, while it probably should mean something more like understanding simulation program A’s possibilities and limitations, and how to interpret and check the results. Figure 1.4.1. Various reasons to simulate pipe flow. Considering all issues important to maintaining the fluid flow from inlet to outlet is sometimes called Flow Assurance. It is a term encountered frequently when studying pipe flow, particularly when hydrocarbons are involved. Still, there is no generally agreed on, clear, common definition of what Flow Assurance is. It is obviously possible to define the system boundaries inlet and outlet in different ways. For instance, when considering petroleum production, the inlet could be described as a reservoir or as one or several wells. Alternatively, it could simply mean the pipe inlet. The latter may have been the most common way to look at the problem in the past, but for gathering networks, the trend for multi-phase simulation tools is towards integrated well and pipe network simulations. Following this trend, many of those involved in developing flow assurance tools are busy creating ever better interfaces so that almost any well simulator can communicate relatively seamlessly with any multi-phase pipe flow simulation package. The same can be said about the outlet end of the pipeline. The trend is to integrate with slug catchers, separators, processing facilities or whatever else the system contains. The complexity of computing pipe flow depends on what the pipe transports and what sort of phenomena we want to investigate. Figure 1.4.2 illustrates some of the different parameters affecting how complicated it is to do those computations, arranged so that the simplest alternatives are on top. The simplest way to classify pipe flow models is probably by specifying how many separate fluids they can deal with simultaneously (single-phase, two-phase or three-phase), and by whether they are able to describe time-dependent phenomena (transient or purely steady-state). Let us have a look at what these differences mean in practice. The first pipe flow models dealt with single-phase flow of water or steam, though not both at the same time. Since many phenomena are multi-phase, such single-phase models have their limitations. Early studies on transient two-phase flow were conducted in the nuclear industry, as it became mandatory to predict the transient flow behavior during potential Loss-of-Coolant Accidents for licensing pressurized water reactors. 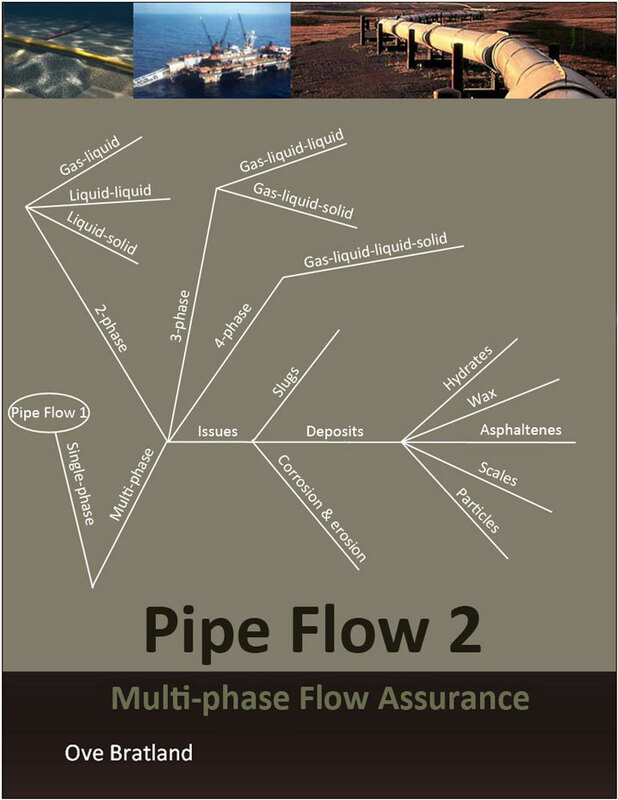 Multi-phase flow can also occur in gas pipelines. If even a small amount of liquid condenses on the pipe wall, it will affect the flow. As we will see in later chapters, a gas pipeline’s capacity can be very sensitive to the wall surface roughness, and it takes only a tiny amount of droplets on the wall to affect the friction significantly. It is essential to know whether condensate forms or not, and dew point specification is frequently part of gas sales contracts. If a small amount of condensate is present, one may get away with simply modifying the friction factor while keeping a single phase model and still get reasonably accurate simulation results. If the amount of condensate gets larger, computations based on single-phase models can no longer do the job. In some cases it is clear from the start that the flow can only be modeled sensibly with multi-phase software. That is the situation when we want to simulate a well flow of oil, gas and water mixed together. Slugging, a common problem, is very much a multi-phase phenomenon, and flow models may be used to investigate how high the gas velocity needs to be to avoid it. Predicting such operational limits, the flow envelope, calls for multi-phase simulations. Some commercially available software packages are steady-state, meaning they can only tell how the pressure, flow, and in some cases temperature, is going to be distributed along the pipe(s) once some sort of equilibrium state has been established. They cannot tell us how conditions are on the way to that equilibrium. We see that already in the definition of a steady-state simulator some of its limitations become apparent: It cannot describe transient phenomena like line packing or pressure surges, nor can it produce a meaningful result if the system itself is unstable and therefore never converges towards a steady state. A fully transient simulator, on the other hand, computes all intermediary steps on the way to the new steady-state when such a state exists. That means transient simulations produce more information, but at the cost of using more CPU-time. Transient programs need some steady-state solver integrated, either in the form of separate steady-state program or by mathematically solving the transient equations for the time derivative being zero. Many of the transient phenomena of interest are simulated using a steady-state situation as a starting point, so transient simulations may rely on steady-state computations in order to define the initial condition on which the transient simulations should be based. Figure 1.5.1 illustrates some of the main parts a simulation program may include. A commercial program package have several separate parts, it may require several licenses and may also rely on many software and hardware interfaces. Even the simplest possible simulation program must at least provide a way to give input data, typically via a Graphical User Interface (GUI). It must know the chemical/physical properties of the fluid(s) involved (PVT-data), and it must contain a computation module. It needs a way to communicate results, for instance via the GUI or via an Application Programming Interface (API) with another program. Figure 1.5.1. Typical flow simulation software structure (simplified). Note that the way programs are structured and which main modules they contain are the same whether the program computes single- or multi-phase flow, steady-state or transient. For instance, Simsci-Esscor’s PipePhase contains one module for multi-phase steady-state simulations, and it integrates with TACITE for multi-phase transient simulations. The user interface is not much affected by the TACITE integration (but the price is!). Similarly, the same computation modules can be used with many different simulation packages, even though the license typically has to be bought separately. Computation modules vary between different programs. They generally contain fluid flow equation solvers, and they may contain one or several thermal models. For multi-phase flow, there is also some sort of flow regime identification software. That determines whether the flow is annular, bubbly, slug, or of another type. Today’s multi-phase software varies somewhat in the way they determine the flow regime in each part of the pipe, but they all rely heavily on empirical data. At the same time, all multi-phase simulators are very sensitive to getting the flow regime right, even though that is one of the least accurate part of the programs. The thermal models in use vary greatly, from the simplest isothermal models to detailed transient models of the heat flow both in the fluid, pipe wall and surroundings. The thermal model in chapter 8 discusses this in greater detail. There is also much variation in how different programs handle PVT-data. In a water pipeline, one may get reasonable results by simply specifying the water’s density, compressibility and viscosity as three constants. Those properties are in reality not constant but vary with temperature and pressure, and an improved model needs to know how those properties are related. It also makes sense to include vapor pressure data to enable the program to give warning in case of cavitation. In systems where cavitation is permitted, the program may be expected to compute exactly how the resulting 2-phase water/steam mixture behaves, and hence PVT-data needs to be available for steam as well. In addition, specific heat and surface tension must be known in order to include heat and flow regime estimation. Some fluids are much more complex than water, and several vendors have specialized in developing PVT-data packages. At the time of this writing, the most used commercially available such packages seem to be the AGA Program, Gaspack™, GasVLe, Aspen HYSYS®, Multiflash, PRO/II, PVTp and PVTSim (Bratland, 2008). Note that a simulation program must update PVT-data in all grid-points as the pressure and temperature change during computation. This means the computation module has to talk to the PVT-module continuously, and experience show that the PVT-data module easily ends up taking most of the computer’s capacity. The simulation program may alternatively read out necessary data first and tabulate them for fast lock-up later, but that introduces its own problems. Since one of the main challenges when creating pipe flow simulation modules is to make the program fast enough, it is important for the PVT-data to be handled efficiently. Early phase concept studies may permit relatively inaccurate computations, in some cases favoring steady-state software over more detailed transient simulations. Note, though, that using the same software through as many phases as possible reduces the need to familiarize with many different interfaces, and depending on how the model is built up, it can also save work. The model should generally be built in several steps, starting by simulating a simplified system. It is best to neglect all nonessential components during the first runs, and get a feel for how the system is performing. Using automated routines for feeding all component data from CAD-drawings into the simulation model, as some software vendors seem to suggest, rarely makes sense, particularly not in an early phase. Components should rather be added gradually while running increasingly sophisticated simulations. Deciding which details to include and where to simplify is an important part of model building, and it happens to be a kind of task humans tend to be better at than computers. Hydrates are ice-like structures which form when water and natural gas are in contact at high pressure and low temperature. Paraffins in crude oil or condensate can lead to wax deposits if the temperature drops to the wax appearance point. Both these phenomena depend on pressure, temperature, chemical properties, and fluid velocity. Although recent progress has been made in cold hydrate pipe flow technology, avoiding hydrates and wax for the most part comes down to keeping the flow relatively hot and/or injecting inhibitors like methanol or glycol. Multi-phase simulations may be used to study how to avoid problems with hydrates and wax, and to some extent how to deal with them if they occur. Since avoiding problems with depositions can be expensive, it pays to use as good flow and thermal models as possible for such studies. Using simulation-based leak detection systems is also becoming increasingly popular and some companies’ market software modules for that specific purpose. Two different detection principles are currently in use: Neural network-based decision making and calculations based on flow models. Implementing a leak detection system involves studies of how accurately various sorts of leaks can be detected by the chosen method when fed by signals from available sensors. The required leak detection accuracy has an impact on the system’s complexity and costs. Deciding which accuracy to target is a significant part of deciding what to install. Note also that the implementation phase has not always been completely successful in previous leak detection projects. It is crucial to bring all the concerned parties on board early in system planning, design and testing, and also while developing appropriate operational procedures. Simulation tools may also be used for operator training and various system testing. Such software is used for operations as varied as pigging, erosion control, corrosion control, sand buildup studies, and nearly any other phenomena related to fluid flow. Again, deciding to which extent those are central issues is something to consider before deciding which details the software needs to take into account in order to satisfy ones requirements. www.advanticastoner.comLarge simulation package with many modules and support offices around the world. Relies on built-in PVT-data. flowmaster.comIntegrates with Matlab. Both liquid and gas. Also thermo modules. Does not focus on systems where relatively complex PVT-data are required. Involved in all sorts of singe-phase pipeline computations. Offices or representatives in 28 countries. b3pe.comOne of the many cheap of-the-shelf steady-state gas networks simulators. Developed by a competent, but very small company. fluidflowinfo.comBoth gas and liquid simulations. Comes with 850 pre-defined fluids in its database. Can also handle Non-Newtonian fluids. aft.comWell designed, modularized steady-state and transient software. Has separate module for PVT-data. www.energy-solutions.comExtensive collection of software modules for design, analysis, optimizing and forecasting oil and gas networks. greggengineering.comGas pipeline simulator. Focuses a lot on scheduling and forecasting. liwacom.deSimulation and optimization of natural gas pipeline systems. mwhsoft.comSpecialize in various types of water pipeline computations. software in this category, and table 1.7.1 should in no way be considered complete. Instead, it intends to illustrate that different software serves different market niches, even though they are mainly built on the same well-known theory. The most important thing to do when considering software in this category may be specifying one’s requirements properly, contacting a vendor, and discussing how those requirements can be met. The steady-state programs are generally relatively easy to use, and they are probably used more than the transient programs. Nearly all multi-phase simulators focus on some sort of transient capabilities, such as their ability to integrate with a third-party transient simulator. That is a strong indication that the developers recognize a trend towards transient simulations. OLGA is today probably the most well documented and advanced multi-phase transient pipe flow simulator on the market, but there are also others, see table 1.7.3. Additional multi-phase transient software packages are under development, and some of the existing ones are being improved. Interestingly, some of the oil companies sponsor several of the development projects at the same time (Bratland, 2008). Ormen Lange is at the time of this writing (2008) the largest natural gas field under development in the Norwegian continental shelf. The field is situated 120 km northwest of Kristiansund, where seabed depths vary between 800 and 1,100 meters. The reservoir is approximately 40 km long and 8 km wide, and lies about 3,000 meters below sea level. The Gas production is planned to become 60∙106 m3/day once full capacity is reached. Using offshore separation of gas and liquids produced from the reservoir would have been a relatively conventional, but also expensive way to develop the project. It was concluded that offshore separation could be avoided and that the produced multi-phase flow could be sent to shore through pipelines directly. For this to be feasible, an advanced flow assurance solution was required. www.simsci-esscor.comDeveloped for simulation of complex networks of pipelines and wells. Both 2 and 3-phase. Can be licensed with the TACITE transient module as an integrated part.PIPEFLONeotechnology Consultants Ltd.
www.tuffp.utulsa.eduTwo-phase liquid-gas isothermal flow. Very cheap, comes with Shoham’s book (Shoham, 2006). Well documented in the book. Table 1.7.2. Multi-phase steady-state pipe flow simulation software. An integrated flow assurance system based on the OLGA multi-phase simulator has now been installed and is in daily use. As described by Aarvik et al., (2007), it includes five sub-systems: The Pipeline Management System, the Virtual Flow Meter System, the Production Choke Control System, the Monoethyleneglycol (MEG) Injection Monitoring and Control System, and the Formation Water Monitoring System. The underlying models start at the reservoir influx zone, and include detailed representations for the subsea wells and templates, production pipelines and on-shore slug catchers. The operator is given access to liquid monitoring data throughout the system and receives recommendations on such vital parameters as choke set points and MEG injection rates. Another important feature is that the system serves as redundancy for the multi-phase flow meters. If and when the wet gas meters fail, useful flow data for each well is still going to be available from the estimates produced by the Virtual Flow Meter System. The flow assurance system can run in four different execution modes: Real Time System Mode, Look-ahead Execution Mode, Trial Execution Mode, and Planning Execution Mode. This flexibility gives operators and planners a wide range of ways to improve their procedures and investigate ‘what if’-scenarios. Figure 1.8.1. Overview of Ormen Lange subsea production system. © Norsk Hydro. aspentech.comOriginally developed for Shell but also used in other projects. No longer developed or marketed. After the gas has been processed onshore in Norway, it is exported to Britain through a 1,200 km subsea pipeline, the world’s longest of its kind. Simulations have been used extensively in every stage of that pipeline project, too, both for selecting main pipeline parameters well as for all the other purposes mentioned in figure 1.4.1. Frankel, M. (1996, 2002): Facility Piping Systems Handbook. Second Edition, McGraw-Hill. CO-LaN Consortium (2003): Documents 1.0 Documentation Set (freely available from colan.org). OPC Foundation: Standards for open connectivity in industrial automation. (available from opcfoundation.org). Ellul, I.R., Saether, G., Shippen, M.E. Goodreau, M.J. (2004): The Modelling of Multi-phase Systems under Steady-State and Transient Conditions – A Tutorial. Pipeline Simulation Interest Group PSIG 0403. Liu, H. (2005): Pipeline Engineering. Lewis Publishers. Shoham, O. (2006): Mechanistic Modeling of Gas-Liquid Two-Phase Flow in Pipes. Society of Petroleum Engineers. Bryn, P., Jasinski, J.W, Soreide, F. (2007): Ormen Lange – Pipelines and Shipwrecks. Universitetsforlaget. 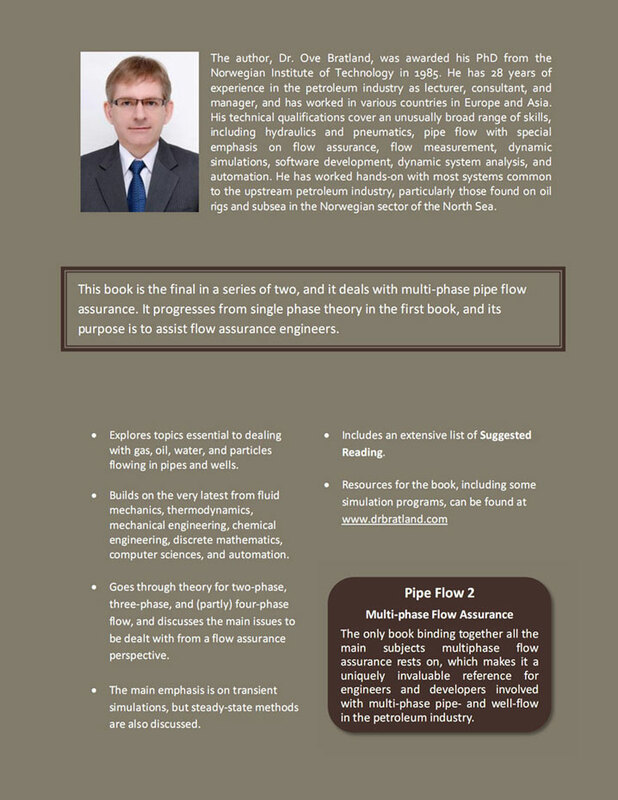 Aarvik, A., Olsen, I., Vannes, K., Havre, K., Kroght, E., C. (2007): Design and development of the Ormen Lange flow assurance simulator, 13th International Conference on Multi-phase Production technology. p.47-64. Bratland, O. (2008): Update on commercially available flow assurance software tools: What they can and cannot do and how reliable they are. 4th Asian Pipeline Conference & Exposition 2008, Kuala Lumpur.